The winter spirit week will celebrate winter sports and clubs with activities at lunch and after school. Thomas Jefferson Leadership has coordinated and planned a spirit week to celebrate everything from the school musical to winter sports. 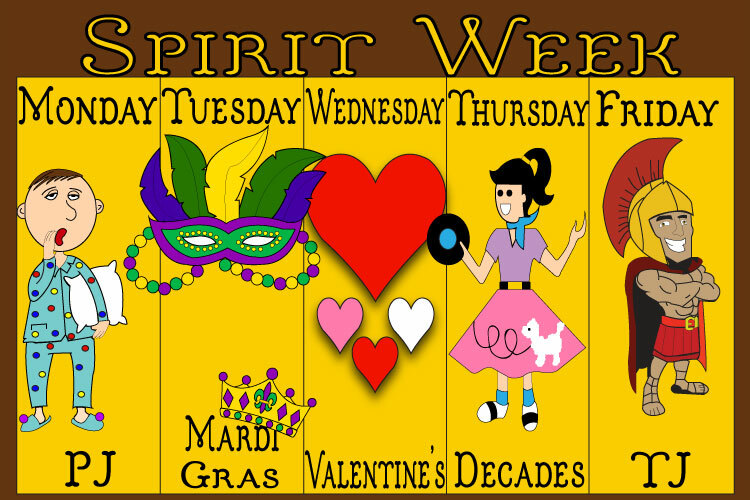 The spirit days for the week of February 12th will be Rest (PJ) Day, Mardi Gras Day, Valentine’s Day, Decades (Throwback) Thursday and TJ day. There will be fun activities throughout the week, ending in a huge basketball double-header on Friday. “The idea for a Mardi Gras spirit week came from years and years ago, when we tried to have a Mardi Gras dance. That did not work out, but since this spirit week is the same week as Mardi Gras, we came up with a Mardi Gras-themed spirit week,” explained Leadership teacher Erin Thompson. On Monday, students wearing pajamas will be able to participate in a pillow fight hosted in the gym, with pillows provided. In the spirit of Mardi Gras on Tuesday, students should wear green, purple, and celebratory beads, and King’s cake will be served at lunch with the person who finds the baby in the cake winning a prize. Wednesday is Valentine’s Day, and students can purchase rose-grams at lunch, which will be delivered throughout the day. One rose is two dollars, and two roses are three dollars. On Thursday, there will be a dance battle at lunch in the dance room to go along with the Decade Day theme. TJ’s school musical Grease opens Thursday night and runs through Saturday evening. There will be a pep assembly on Friday where students can show their school spirit for TJ Day. After the pep assembly (where Honor Platoon, Drill, and Color Guard will perform alongside the drumline, choir, orchestra and band), there will be a tailgate with food trucks and games in the parking lot. Later that day, all Spartan basketball teams will be competing at home, with Unified Basketball after the pep rally, Boys’ Basketball at 5:30 p.m., and Girls’ Basketball at 7:00 p.m.. Spirit Week is an important TJ tradition, where students are able to express themselves and celebrate the school’s accomplishments. Thanks to TJ’s Leadership class, Spartans have the opportunity to get in the spirit of Mardi Gras and enjoy a busy week of festivities.